WASHINGTON From purchases and prices to builder sentiment and construction, the U.S. housing market is making consistent gains. The latest evidence came in reports Monday that sales of previously occupied homes rose solidly in October and that builders are more confident than at any other time in 6 1/2 years. Will the FHA require taxpayer help? New-home sales and home-price indexes have reached multi-year highs. And Lowe's (LOW) on Monday reported a surge in net income, a sign that home-improvement retailers are benefiting. The housing market's recovery still has a long way to go. But for now, it's helping prop up an economy that's being squeezed by a global slowdown and looming spending cuts and tax increases. Joseph LaVorgna, an economist at Deutsche Bank (DB), estimates that the housing recovery could boost U.S. economic growth by a full percentage point next year. That's because a stronger housing market would mean more jobs, especially in industries like construction, and more consumer spending. "Housing could provide a meaningful - and critical - lift to overall economic activity when other growth drivers, like exports, are slowing," LaVorgna said. 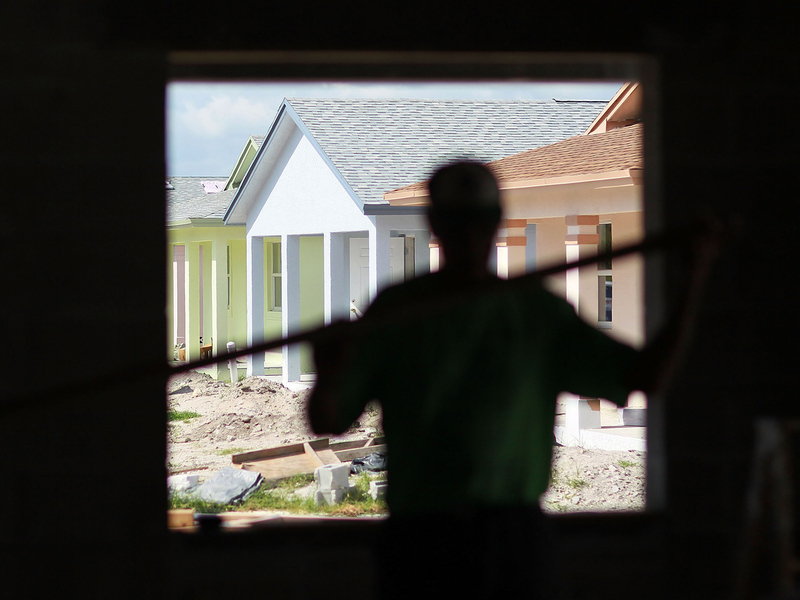 Helping drive the housing rebound is growing confidence among builders. An index of builder sentiment compiled by the National Association of Home Builders/Wells Fargo builder rose to 46 this month, up from 41 in October. It was the highest reading since May 2006, just before the housing bubble burst. Readings below 50 signal negative sentiment about the housing market. The index last reached that level in April 2006. Still, the index has been rising since October 2011, when it was 17. It's surged 27 points in the past 12 months, the sharpest annual increase on record. A second report Monday said sales of previously occupied homes are near five-year highs, excluding temporary spikes in 2009 and 2010 when a homebuyer tax credit boosted purchases. Sales rose 2.1 percent in October to a seasonally adjusted annual rate of 4.79 million, the National Association of Realtors said. Sales are nearly 11 percent higher than they were a year ago, though they remain below the more than 5.5 million that economists says is consistent with a healthy market. The Realtors' group said Superstorm Sandy delayed some purchases of previously occupied homes in the Northeast. Sales fell 1.7 percent there, the only region to show a drop. Those purchases will likely be completed in coming months, the group said. A key factor fueling the gains is a gradually improving economy, which has increased the number of people looking for homes. At the same time, fewer homes are available for sale. The low supply is helping push up prices. Only 2.14 million homes were available for sale at the end of October, the lowest supply in 10 years. It would take just 5.4 months to exhaust that supply at the current sales pace. That's the lowest sales-to-inventory ratio since 2006. "We built too many homes during the good years, and we have finally gotten rid of that excess," said Patrick Newport, an economist at IHS Global Insight. In addition, mortgage rates have hit all-time lows. And rents are rising, making the purchase of a single-family home or condominium more attractive. The rise in people seeking to buy should support more construction over the next year or two, economists say. More Americans are looking set up their own households after living with relatives or friends in the recession and its aftermath. In a healthy economy, the number of new households typically reaches 1.2 million a year. It averaged only 570,000 a year from 2007 through 2011, according to Census data compiled by Bank of America Merrill Lynch (BAC). It reached 635,000 last year. The Census expects about 1 million new households this year. In September, builders broke ground on new homes at a seasonally adjusted annual rate of 872,000. That was the fastest pace in more than four years. Yet it still trailed the rate of household formation. The trend suggests that home construction will have to keep rising. Low inventory "is a sign that housing markets are tightening, and that builders will continue ramping up on new construction to fill demand," Newport said. For all the improvement in the housing industry, sales and prices remain below normal levels. In part, that's because many potential buyers can't meet stricter lending standards or make the larger down payments that banks have required since the housing bust. That can be a particular obstacle for first-time buyers. They accounted for 31 percent of home sales in October. That was down slightly from September and below the 40 percent common in a healthy market. Federal Reserve Chairman Ben Bernanke said last week that banks' overly tight lending standards might be limiting home sales and holding back the economic recovery. Still, the steady improvement in housing is benefiting the economy. Each new home built creates about three jobs for a full year and yields $90,000 in taxes, according to the homebuilders' group. More building also creates demand for steel, glass and other materials. People who buy new homes usually buy more furniture, carpets and appliances. That typically generates more manufacturing and retail jobs. More home construction generates more demand for pick-up trucks, as builders and contractors add trucks to handle more work. Chrysler said last week that it was adding 1,000 workers to a factory that makes Dodge Ram trucks. Ford and General Motors have also said demand for trucks is rising. All told, Alan Levenson, chief economist at T. Rowe Price, estimates that the housing recovery could add 25,000 jobs a month next year. Home improvement chains are benefiting. In addition to Lowe's higher earnings, Home Depot (HD) last week reported slightly higher third-quarter net income. And Home Depot raised its full-year forecast. The clearest sign of a better housing market may be the increase in prices. A measure of U.S. prices jumped 5 percent in September compared with a year ago, according to private data provider CoreLogic. That was the largest year-over-year increase since July 2006. Other gauges have also shown solid gains in home prices over the past year. Higher home prices can also make homeowners feel wealthier and more likely to spend more. And consumer spending accounts for about 70 percent of the U.S. economy.